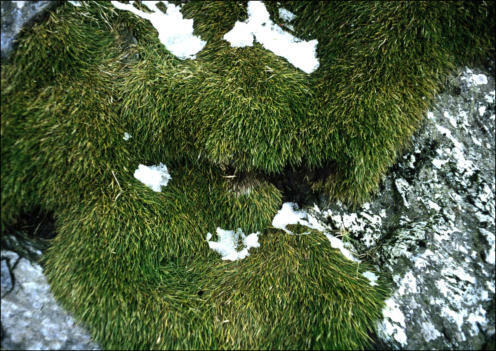 For a full description of the mosses of Antarctica see: The Illustrated Moss Flora of Antarctica Edited by Ryszard Ochyra, Ronald I. Lewis Smith & Halina Bednarek-Ochyra Cambridge University Press, Cambridge, 2008. ISBN 978-0-521-81402-7, 685 pp. 2. 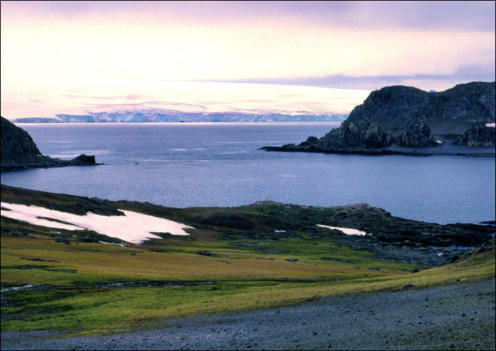 Signy Island (South Orkneys) vegetation See also Antarctic peat page 1: Overview of a landscape dominated by mosses and lichens. 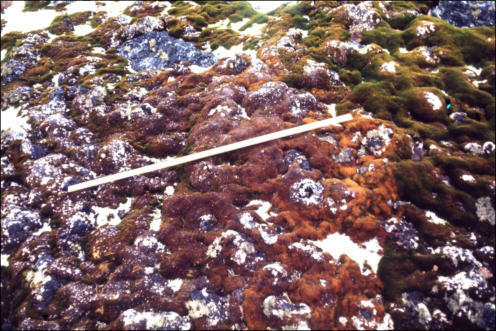 Mosses prefer the damper areas and lichens the drier ones. 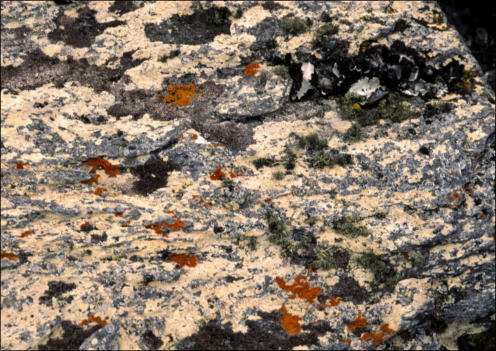 Lichens can grow directly on rock. 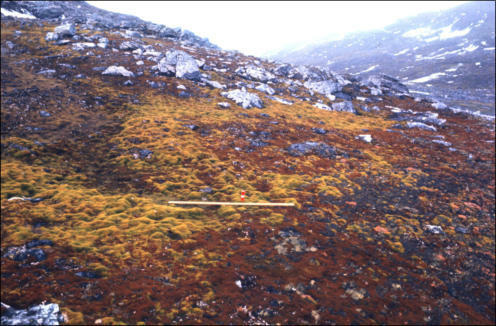 2-3: Turves of the mosses Chorisodontium (yellow-green) and Andreaea (reddish-orange). 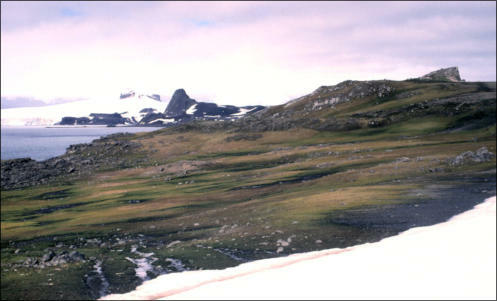 4: Various different moss-dominated communities are visible here, including those dominated by Chorisodontium, Andreaea and Drepanocladus. 5. 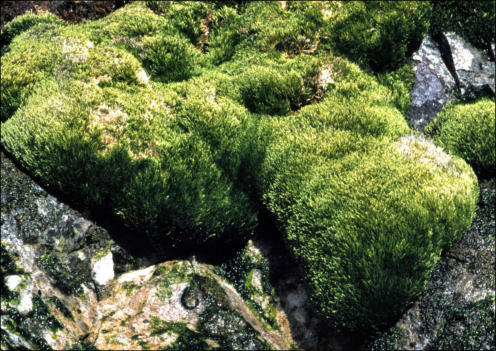 Rounded hummocks of the moss Chorisodontium aciphyllum colonising a carpet of the moss Drepanocladus uncinatus. 6. 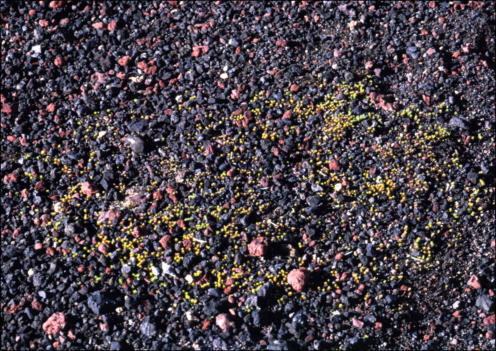 Early stages of the formation of a turf dominated by Chorisodontium aciphyllum. 7-8: Carpets of the moss Drepanocladus uncinatus. 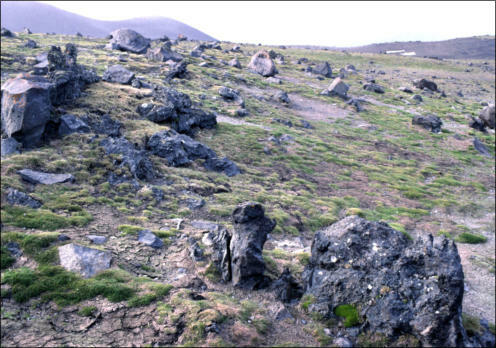 9: General view of moss-dominated vegetation. 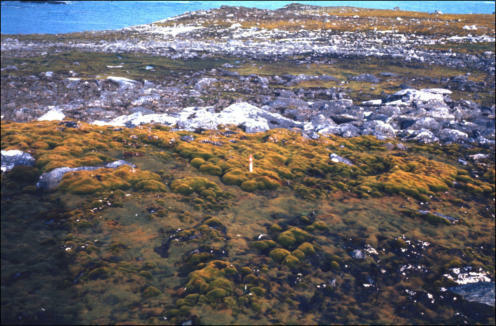 10: Coastal orange lichens (Xanthoria and Caloplaca). 11: Unvegetated patterned ground showing stone circles. 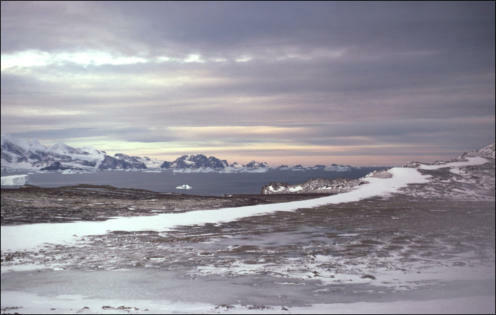 These pictures all taken in 1975 while James was working for the British Antarctic Survey. 3. 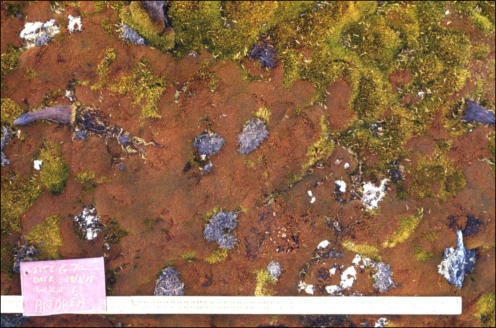 Some Antarctic Peninsula mosses & lichens 1-2: Carpets of the moss Drepanocladus uncinatus on Aitcho Island, South Shetland Is. 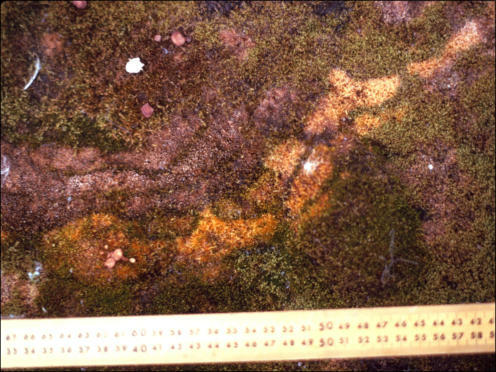 3: Carpet of the moss Bryum pseudotriquetrum at Brown Bluff. 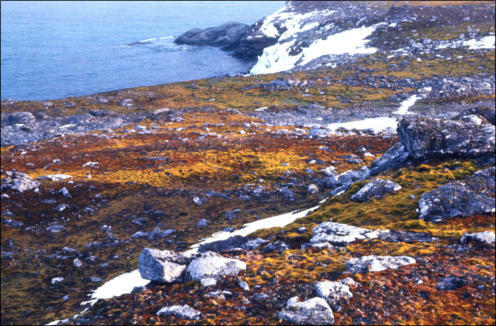 4: A small moss carpet, ?Pohlia nutans, on an island near the south end of the Lemaire Channel. 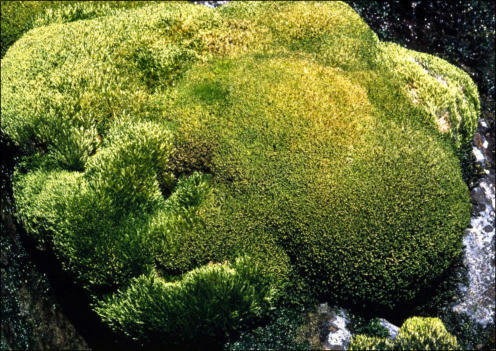 5-6: Hummocks of the moss Bracythecium austro-salebrosum. Drepanocladus uncinatus is also present on picture 5, comprising about half of the hummock, centre right. 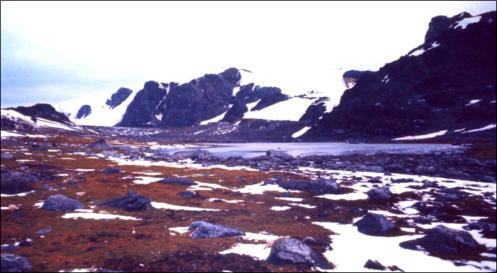 7: The moss Polytrichum alpinum colonising volcanic gravel on Deception Island. 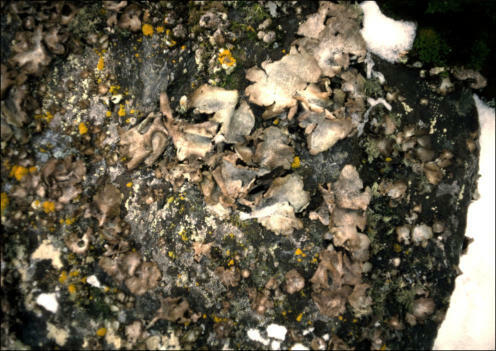 8: Several species of lichen colonising a rock at Shingle Cove, Coronation I. 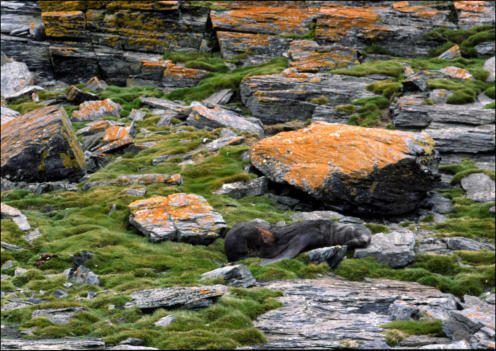 (South Orkneys). 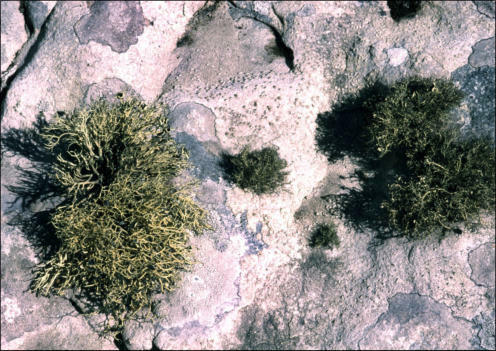 9-10: The ‘leafy’ lichen Umbilicaria growing on rocks (with other species of lichen visible). 11: Usnea lichens growing on a rock, with crustose lichens also visible. These pictures all taken in 1998-9. 4. 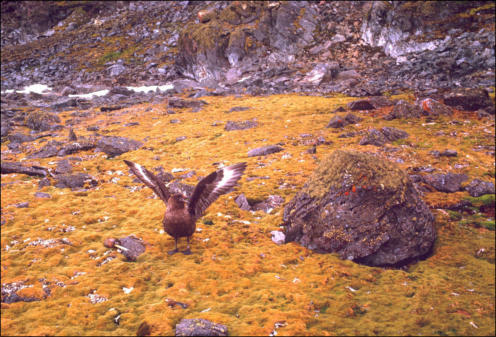 Terrestrial algae and fungi 1: The green alga Prasiola crispa is common on the ground in penguin rookeries. 2-3: ‘Red snow’ composed of the green alga Chlamydomanas nivalis. Note that the green chlorophyll is masked by a red pigment. 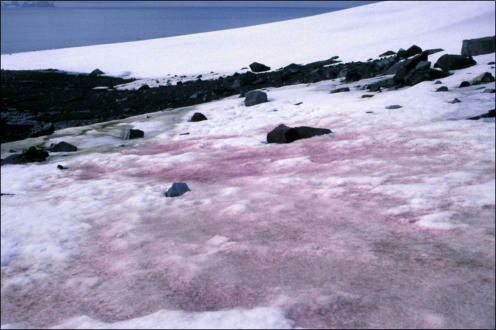 This alga grows directly on the snow, and becomes concentrated as the snow melts at the end of summer causing the snow to turn pink. 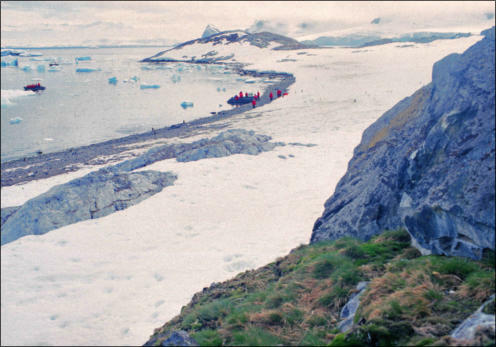 Picture 3 shows a small ice-cap covering an island which has melted back to ice with a covering of snow algae. 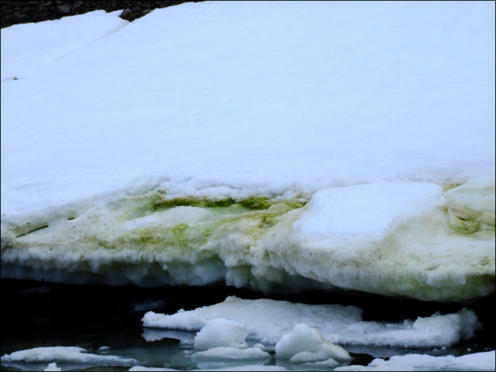 4: Green snow (picture taken in Spitsbergen). 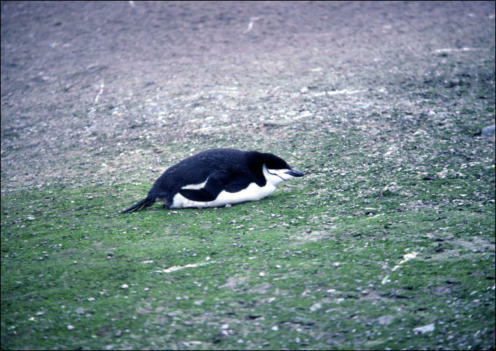 Green snow is often found near bird colonies where the bird droppings fertilise the snow. 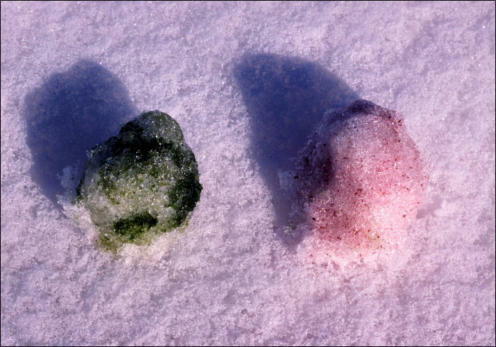 5: Two snowballs, one made of red snow and one of green snow. 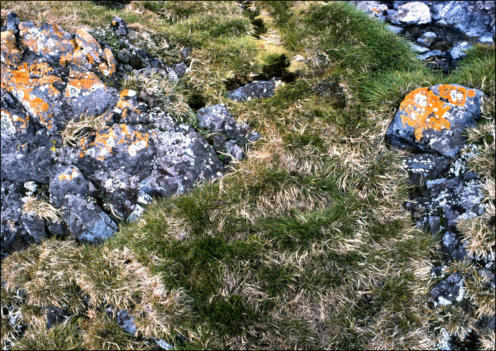 6: A fungal fairy ring in a turf of the moss Chorisodontium aciphyllum on Signy Island (South Orkneys). Note the metre rule for scale. 7: A close-up of a fairy ring: the fungus is advancing right to left. 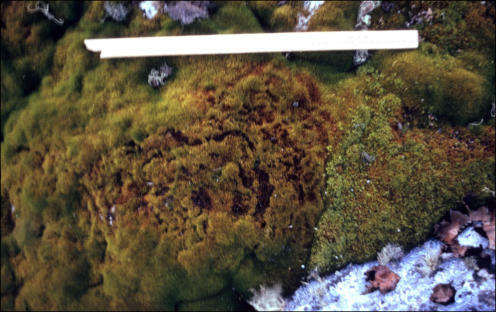 8: Close-up of the moss Chorisodontium showing ‘pockmarks’ resulting from a fungal infection. 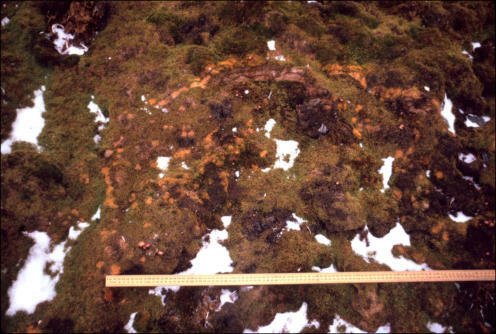 9-10: Fairy rings spreading through a carpet of the moss Drepanocladus uncinatus. 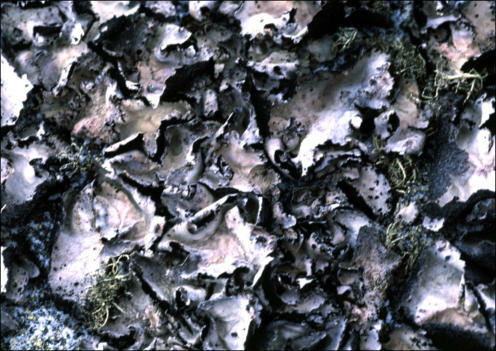 Note mushrooms are visible. 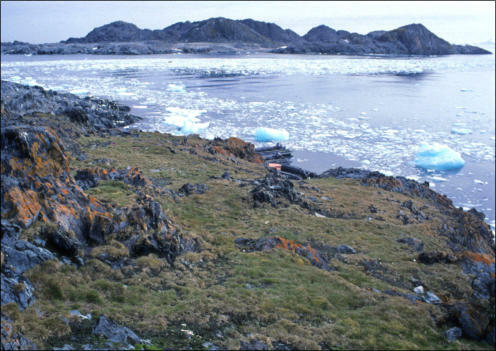 For further information on fairy rings in Antarctic moss see the paper: Fenton, J. 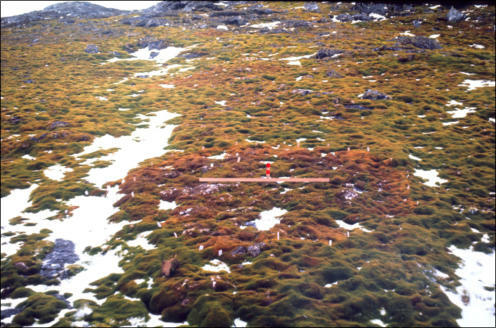 1983: Concentric fungal rings in Antarctic moss communities. Transactions of the British Mycological Society Vol. 80. 1. Antarctic hair grass Deschampsia antarctica These pictures all taken in 1998-9 1: Close-up of the grass. 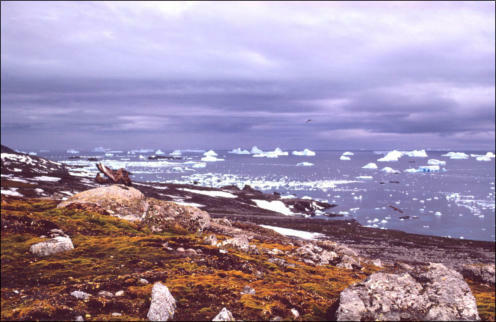 2: Shingle Cove, Coronation Island (South Orkneys). 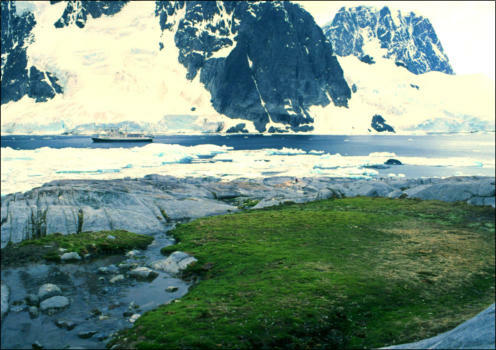 3: Cuverville Island. 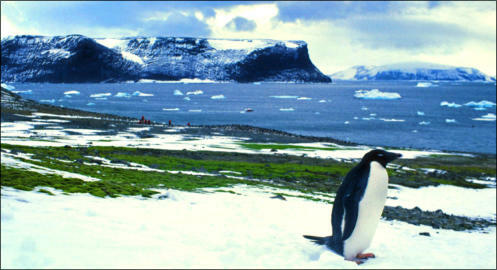 4-6: Penguin Island, South Shetlands. 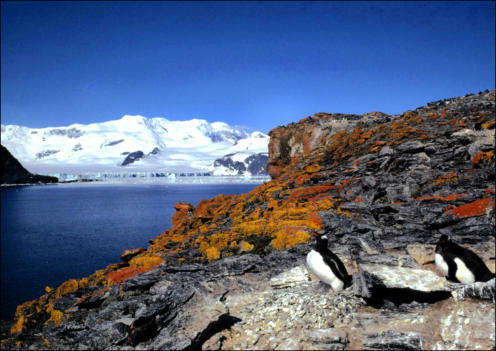 The vegetation of the Antarctic Peninsula and surrounding islands is dominated by mosses and lichens. There are only two native vascular plants, Antarctic hair grass Deschampsia antarctica and Antarctic pearlwort Colobanthus quitensis. This page illustrates some of the different vegetation types. 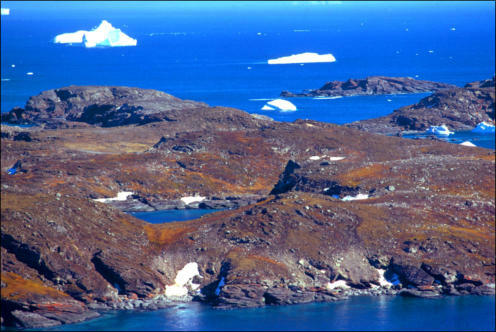 Use the link above for pictures of Antarctic peat.